The spirits are called Phee Pop and Phee Mae Mai and the villagers are taking drastic action – especially men. In one house two healthy men died within seven days of each other from what appeared to be fits. But Sanook reported that marks of strangulation had been found on the neck of one of the men – clear signs that an ogre was responsible, said respected village elders. In another case a 16 year old girl was killed when her motorcycle mysteriously collided with another with a sidecar. That was the fifth death and the final straw. Now virtually every house has an item of red clothing outside with the wording in Thai: “This house has no men”. 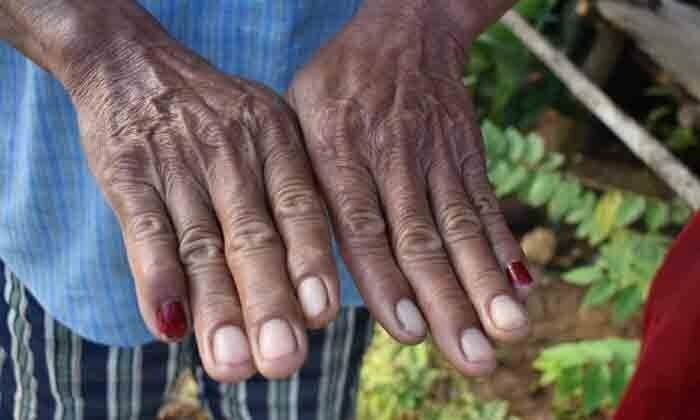 Men throughout the village of Phu Hang in the north eastern province have decided to paint their fingernails in an effort to look more like women to ward off the evil that appears to target males to a greater degree. Sanook went to the village and found that people were living in fear of even leaving their houses especially after dark. By early evening the village was as quiet as the grave with villagers cowering in their homes amid fears that they would be the next victim of the ogre and the evil widow of doom. Everyone is clamoring for amulets and other protection as the fear spreads. Doctors – appearing not to share the villagers views on the supernatural – have given advice on how best to guard against non-communicable diseases.